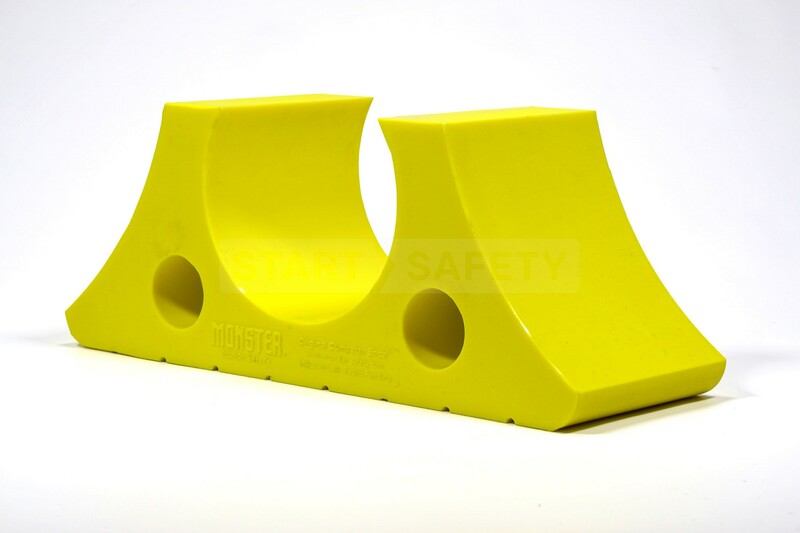 Monster Dumpster Shoes are designed to solve the widespread problem of steel dumpster wheels denting and damaging the ground surfaces that dumpsters are placed on. Drivers have resorted to placing pieces of wood on the ground surface in an attempt to prevent surface damage which is ineffective, inefficient and results in the driver having to get in and out of the truck cab multiple times while attempting to position the wood pieces under the dumpster wheels. Wood is the old way of protecting surfaces.. The Monster Dumpster Shoe is the future! Features molded grip on base to eliminate dumpster slippage. Provides quicker loading and unloading times by eliminating the need to get in and out of the truck cab. Dumpsters won’t role or move with the dumpster shoe. Reduces wear and tear on trucks and operating parts. Lower insurance costs by avoiding damaging asphalt surfaces. Wheel Cavity - Available in 6 inch and 8 inch models for use on the industries common dumpster wheels. 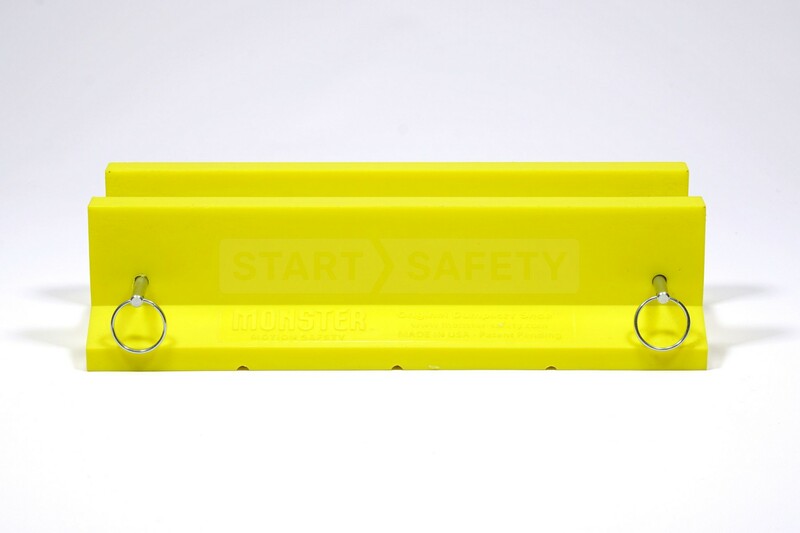 Loop Holes – easily secure Dumpster Shoes to side of dumpster with bungee cords. Molded Grip - Eliminates slippage while deploying a dumpster. Shoes are curled upward on the edges so you can push or drag a dumpster like a sled on hard surfaces. Angled Footprint - For a self leveling more stable and secure dumpster base. 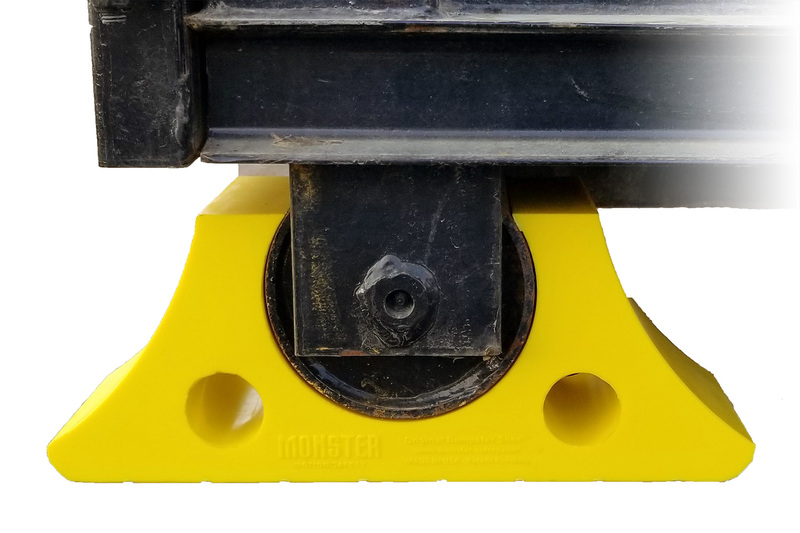 Frame Cavity - Available in 1.75 inch and 2.25 inch models for use on the industries common dumpster that have no front wheels. 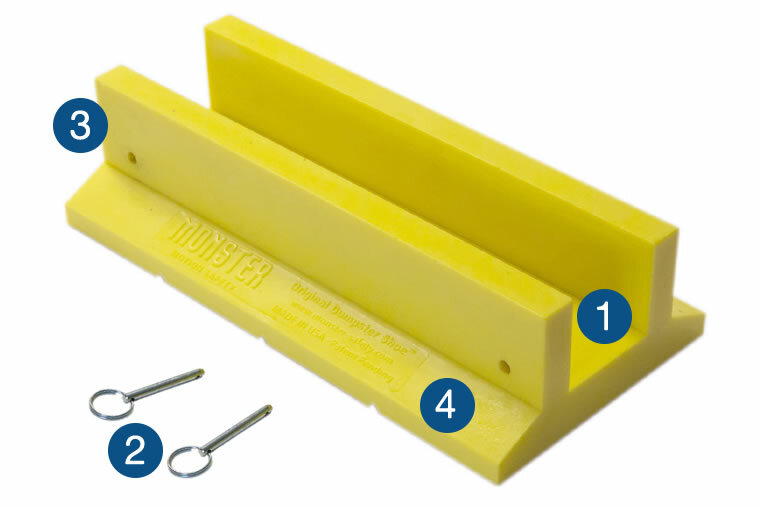 Pins – Easily secure Dumpster Pads to bottom of dumpster. 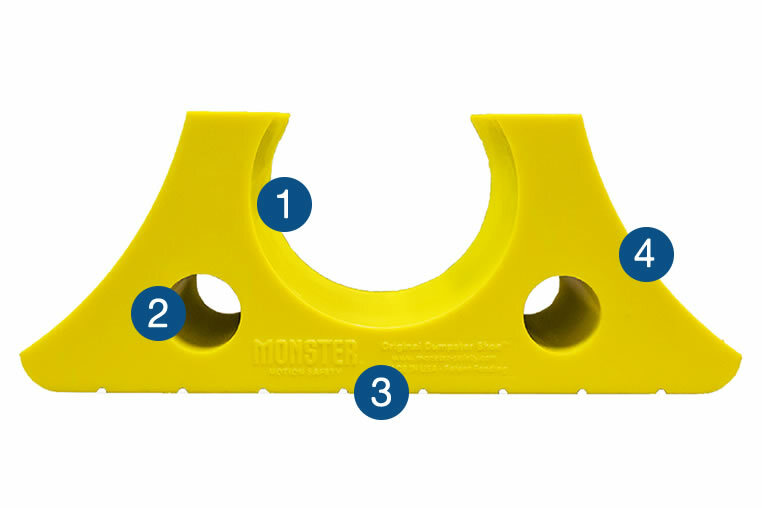 Molded grip - Eliminates slippage while deploying the pad. Angeled Footprint - For a more stable and secure dumpster base. 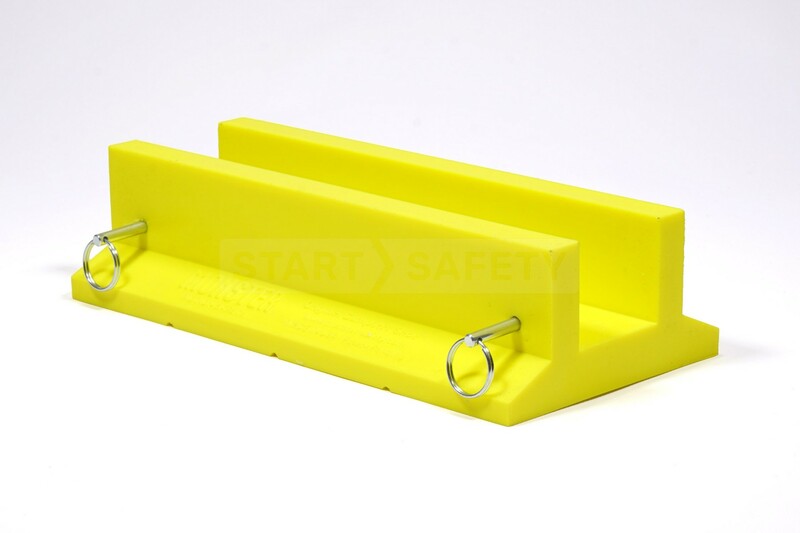 are manufactured with highly durable, lightweight polyurethane. They are designed to provide a large footprint for dumpster wheels to prevent damage to asphalt parking lots. 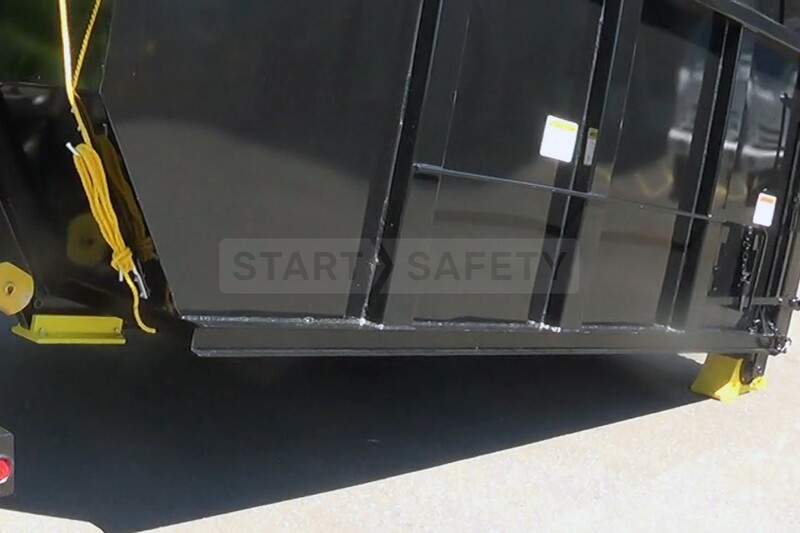 Dumpster shoes are quick and easy to install, and make the process of loading and unloading dumpsters safer. Checkers Safety polyurethane products are manufactured at company headquarters in Broomfield, Colorado. Polyurethane is resistant to extreme weather conditions, tears, abrasions, oils, and solvents. 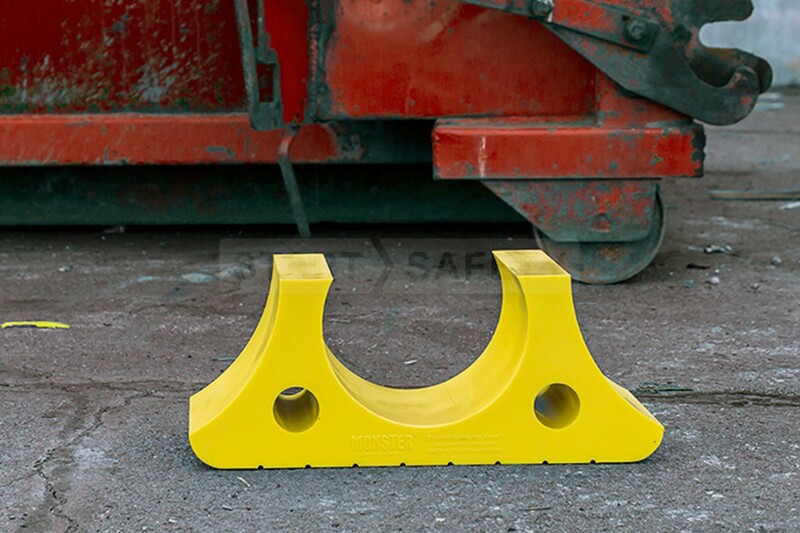 The Dumpster Shoe is manufactured with high visibility yellow polyurethane. Long-lasting product life span results in cost savings. Rear Shoe DS6-Y 6 in. wheel diameter 18 in. 6 in. 7 in. 14 lbs. Rear Shoe DS8-Y 8 in. wheel diameter 20 in. 8 in. 8 in. 23 lbs. Front Pad DSLP175-Y 1.75 in. cavity slot 12 in. 5.5 in. 3 in. 4 lbs. 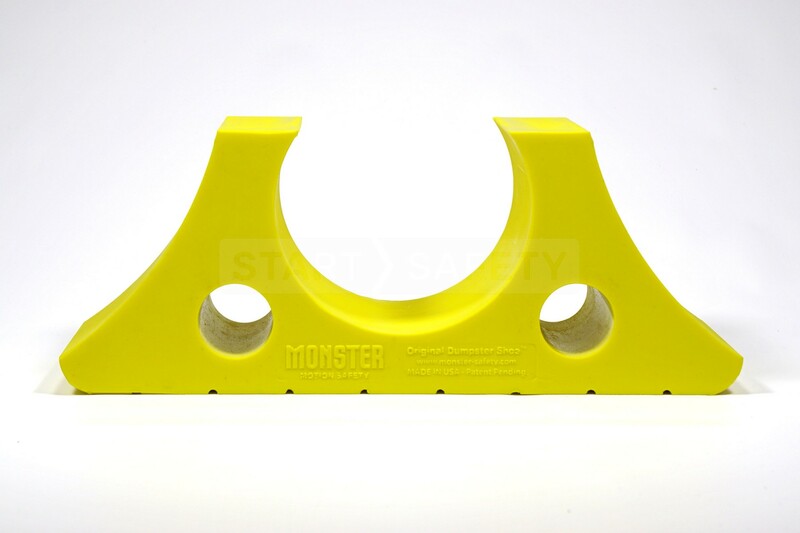 Front Pad DSLP225-Y 2.25 in. cavity slot 12 in. 6 in. 3 in. 4 lbs. Speak to our sales team toll free at (800)-9662, our trained sales team will be more than happy to assist you in finding the right cable protection solution for your needs.